Bret Easton Ellis (born March 7, 1964) is an American writer. Ellis was born in Los Angeles, California to rich parents. He was raised in Sherman Oaks, Los Angeles. He attended schools for the rich and famous. He also attended Bennington College. His first novel was Less Than Zero in 1985. His next novel was The Rules of Attraction in 1987. Ellis's third novel was American Psycho in 1991. It made him famous. In 1998, it was still selling 25,000 copies a year. The book's hero is an investment banker and sadistic serial killer named Patrick Bateman. His violent acts are described in detail. The Los Angeles chapter of the National Organization for Women (NOW) called for a boycott of the book. NOW described it as "a how-to novel on the torture and dismemberment of women". Easton's publisher Simon and Schuster ended their contract with Ellis. Vintage Press bought and published the book. Ellis got several death threats, but the book sold well. The novel was made into a movie in 2000. Christian Bale played the lead role. In 1994, Easton's book of 13 related short stories, The Informers, was published. The stories were set in Los Angeles. Glamorama was published in 1998. Lunar Park was published in 2005. 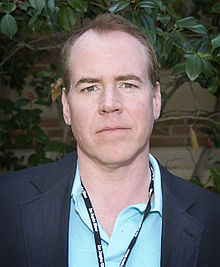 ↑ 1.0 1.1 1.2 1.3 "Biography: Bret Easton Ellis". Illiterarty.com. Retrieved 18 December 2014. ↑ 2.0 2.1 Toby Young (12 December 1998). "The Books Interview: Bret Easton Ellis, A felt life, rough or smooth". independent.co.uk. Retrieved 18 December 2014. ↑ 3.0 3.1 3.2 Edwin McDowell (6 December 1990). "NOW Chapter Seeks Boycott of 'Psycho' Novel". New York Times. Retrieved 18 December 2014. ↑ 4.0 4.1 "American Psycho (2000)". Flixster. Retrieved 18 December 2014. This page was last changed on 30 August 2017, at 22:25.